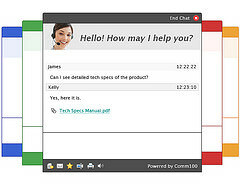 One of the greatest benefits of adopting a live chat customer service system is that it is incredibly time efficient and makes the customer service experience more convenient. This is because an employee can solve numerous customer inquiries at a time. Another benefit of live chat is its cost efficiency. In fact, studies show that company’s sales have increased by 300% after adopting live chat software on their e-commerce site.